Worn by NBA Players. 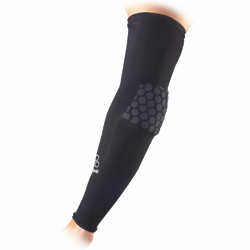 Form fitting performance compression sleeve featuring HexPad (TM) Technology. 4" HexPad (TM) covers the elbow for added protection. Fits comfortably from the mid-arm to the wrist. Includes McDavid's premiun Ultra hDc (TM) Moisture Management Technology to insure comfort. Unisex design and universal fit. Colors: Black or White.